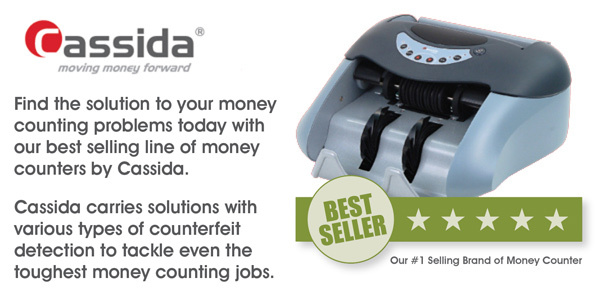 The Cassida 5700 Money Counter incorporates the industry’s first bill flipper design, combining the ergonomics of a top loading bill counter with the economical design of a back loader. This means you get the convenience of a top loading machine, without the higher prices they usually demand. A large LED screen showcases the number of bills counted, as well as denominations and total count value, when using the available ValuCount™ feature. 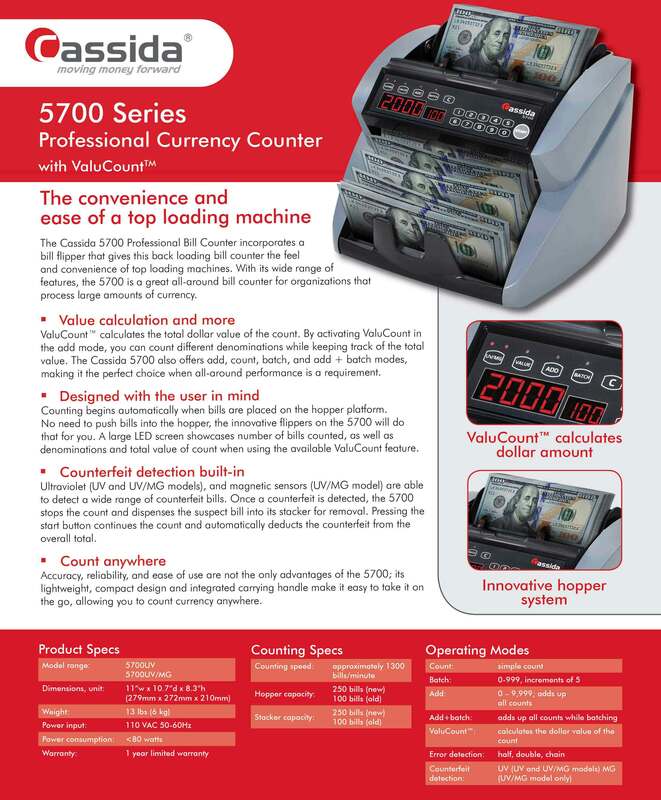 With its wide range of features, the 5700 is a great all-around bill counter for organizations that process large amounts of currency. The Cassida 5700 Bill Counter’s innovative bill flippers push bills directly into the hopper, eliminating the need for bills to be manually flipped, which is an industry first. The bill counting begins automatically when money is placed in the hopper platform, similar to a top load counter. An increasing trend in counterfeit money has forced many businesses to search for a way to combat fraud. The 5700 is available with either ultraviolet (UV), or ultraviolet and magnetic (UV/MG) sensors, which are able to detect a wide range of counterfeit bills. Once a counterfeit is detected, the 5700 stops the count and dispenses the suspect bill into its stacker for easy removal. Please be aware that no currency counter on the market is guaranteed to catch all counterfeit bills 100% of the time. With features such as add, count, batch, and add + batch modes, as well as the new ValuCount™ technology, the Cassida 5700 billing counting machine is a well rounded solution for any business that deals with large amounts of cash. ValuCount™ caclulates the total dollar value of the count. By activating ValuCount™ in the add mode, you can count different denominations, while keeping track of the total value, a feature that is exclusive to Cassida machines and gives you some of the properties of a discriminating money counter, without the expensive price tag. Accuracy, reliability, and ease of use are not the only advantages of the 5700 money counting machine – its lightweight, compact design and integrated carrying handle make it easy to take it on the go, allowing you to count currency anywhere. We are an authorized Cassida dealer. Please remember that it is best to purchase products from manufacturer authorized dealers, to be sure your warranty will be honored, should the need arise in the future. Additional, optional, accessories also available (see bottom of page).